There is an oddball in every family . . . In the family of OKI Heat Transfer color laser printers, this distinction belongs to the new OKI pro6410 NEON Color Laser Printer. What separates this unit from its heat transfer siblings? · The OKI pro6410 NEON prints using fluorescent toners, including white, allowing the output to "glow in the dark" when under a black or fluorescent light. 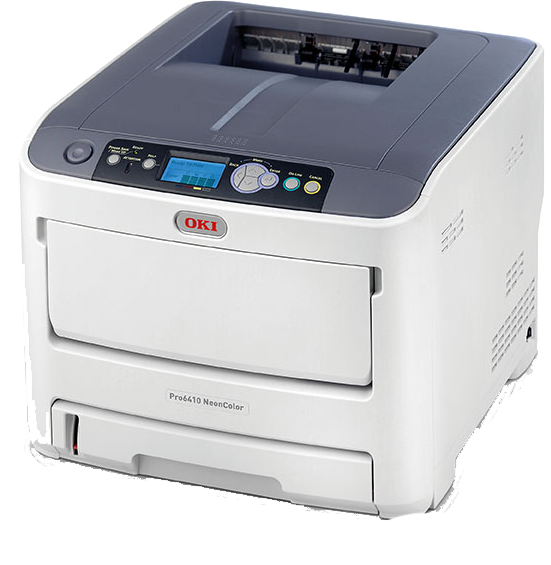 · The OKI pro6410 is the only "interchangeable" printer offered by OKI, meaning you can remove the fluorescent white toner cartridge / image drum and replace it with a standard black toner and image drum for office printing. Cheer & Spirit Teams - This market segment is perfect for neon printing, because anything designed or produced for the Cheer and Spirit market is made to "stand out". If you combine the neon capabilities with other go-team decorating methods (glitter, rhinestones, etc. ), you will produce winning apparel products that will get Cheer and Spirit teams fired up! Safety Gear - When you can combine glowing neon graphics with the ability to decorate 100% polyester garments, the OKI pro6410 NEON is the perfect printing tool to decorate and logo "reflective and safety" clothing. The low-temperature transfer papers do an excellent job of decorating these reflective materials without damaging the material integrity. If you service the construction or safety industries, consider the new OKI pro6410 NEON printer. Disco Amigos - Anyone who likes the nightlife and wants to boogie will appreciate your ability to produce designs that "pop" under the black lights of their favorite club, dance hall or disco. Also, employees of these establishments tend to appreciate glow-in-the-dark graphics as much as their patrons. The OKI pro6410 NEON would be a great addition to address both the "unique" and "on demand" nature of these bar and restaurant clients. So, if you are an "oddball" like the OKI pro6410 NEON Color Laser, contact Condé Systems for information and output samples from this unique NEON color laser printer!